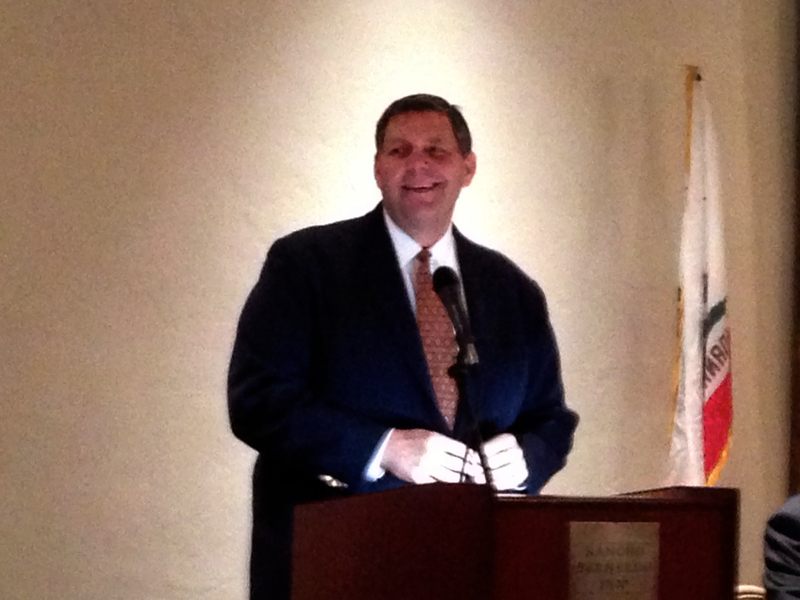 Last night I was pleased to be on hand as, in front of an enthusiastic crowd of over 300 GOP leaders and activists at the monthly meeting of the San Diego County Republican Party Central Committee, former State Senator Jim Brulte officially kicked off his campaign for Chairman of the California Republican Party. Popular San Diego County Party Chairman Tony Krvaric presided over the crowded house. Senator Brulte started off his remarks by comparing the California Republican Party to the San Diego Chargers, saying that the Chargers had a terrible season but would come back, and so would the California GOP. Brulte told the crowd that he got his start in politics as an elected member of his central committee in San Bernardino County. Brulte talked about how it was not only bad for the GOP, but for the State of California to have one political party be so dominant. He asked the committee what kind of craziness it was that in the context of Sacramento’s Capitol Jerry Brown was being considered the moderate. Senator Brulte laid out his plans which include the need for the CRP to establish its own statewide fundraising network, so that the party would not be reliant on the top of the ticket, or financial support from legislative leaders. He talked about the need to export the “San Diego GOP model” for grassroots activism all around the state — because a resurgence in our “ground game” would be essential for future victories. Finally Brulte talked about the importance of recruiting local candidates for office that reflect the changing demographics of our state. Brulte closed by committing to everyone that if elected at the State GOP Convention in March, he would wake up (just about) every day thinking about how to advance these goals, and how the California Republican Party can succeed in electing more Republican candidates to office. As soon as Brulte was finished with his remarks, longtime San Diego GOP activist Derrick Roach made a motion for the county party to endorse Brulte’s bid for Chairman, which was unanimously approved by the entire committee. Some of the notables in the crowd included State Senators Joel Anderson and Mark Wyland, former Assemblyman Martin Garrick, San Diego City Councilmembers Kevin Faulconer and Mark Kersey, District Attorney Bonnie Dumanis, and City Attorney Jan Goldsmith (who introduced Brulte, and spoke about his time serving as Assistant Leader to Brulte when Republicans picked up 41 seats in the Assembly in 1994). Brulte certainly rolls out of this important meeting with a lot of momentum — and with a full plate ahead with speeches coming up to the Central Committees in Los Angeles, Orange, Riverside, and San Bernardino County Committees in the coming weeks. If his reception by the grassroots activists in San Diego is any indicator, Brulte’s message of a return to the “nuts and bolts” of winning campaigns will be well received all around. This entry was posted on Monday, January 14th, 2013 at 11:34 pm and is filed under Blog Posts.